VINNY TEN RACING has officially unveiled the stunning new Nissan that well-respected and record-setting driver, Vinny Ten, will use to make his return to drag racing competition in 2016. For over a quarter of a century, Ten has worked with turbocharged, multi-valve import engines and developed a reputation as one of the best when it comes to high-performance import cars. Not just a builder and tuner, Ten also has a long and successful career as a driver. Ten made history behind the wheel of his Toyota Supra, and shattered more records with that one car than many will achieve in a lifetime. He drove both the world’s first six-second Nissan and the first 200+ mph Nissan. Ten also secured the IDRC Outlaw champion in 2003, and won two NHRA Wally trophies at Englishtown, New Jersey and Pomona, California. Ten found tremendous success both as a driver and as a builder in series such as NHRA, NOPI, and more. 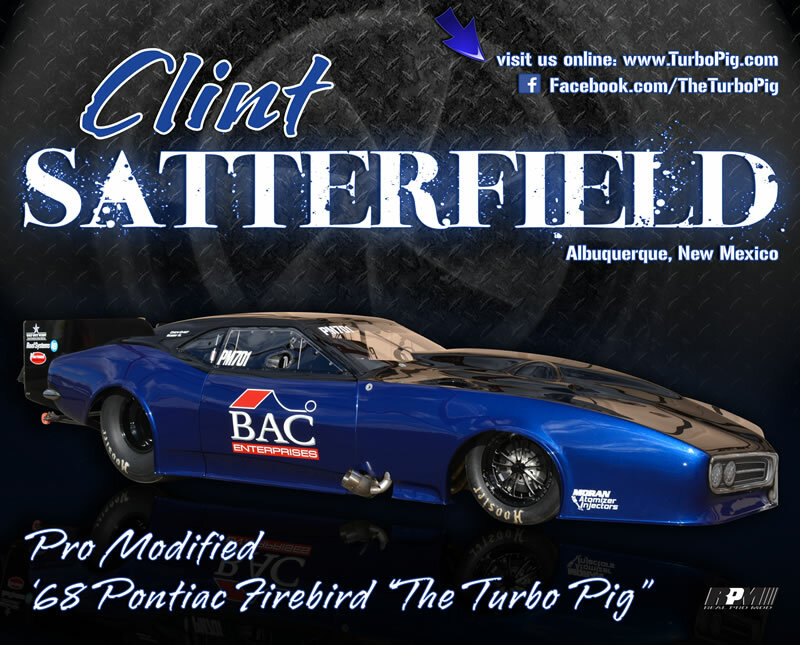 Over the years, his name has become synonymous with top-level import drag racing. After taking time off to grow and develop his business, Vinny Ten Racing, which is located on Long Island and produces some of the quickest and fastest import cars in the nation, Ten decided to make his long-awaited and much anticipated triumphant return to drag racing. “I think we’ll be able to get down into the low 6s with this setup. I have high hopes for this car, and I think that we can bring a lot of positive attention to the imports in a world that’s currently dominated by big block domestics. Just because it’s a foreign car doesn’t mean it can’t compete or run with the fastest in the world,” said Ten, whose primary goal is to safely re-legitimize import drag racing in the United States. Ten’s new car was unveiled at a special event hosted by Massapequa Nissan in Seaford, New York on Sunday, November 15, 2015. The event drew a huge crowd of enthusiastic fans from all over Long Island and beyond, and featured great entertainment including an on-site car show and special autograph session with Ten. The Real Pro Mod (RPM) association re-launched its website today with a new look, new features and more updates on this growing group of racers. Fans can learn more about their favorite RPM drivers, find out who is making news and browse through photo galleries of RPM drivers at NHRA Pro Mod Series events. 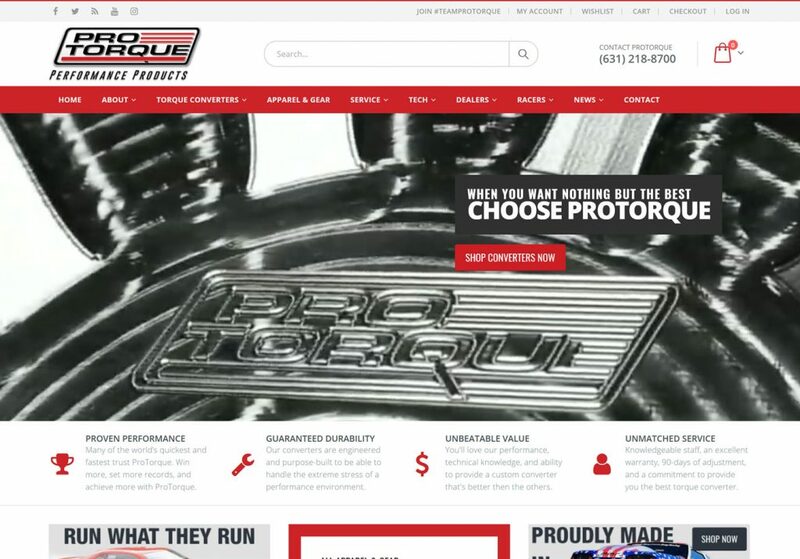 The website was built and created by Ainsley Jacobs of P.TEN Marketing, which specializes in digital and web design for motorsports and performance aftermarket industry. 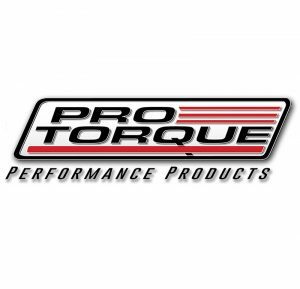 The Real Pro Mod (RPM) association was created by Pro Mod team owners and drivers to preserve and promote the future of this class of drag racing. With more than 3,000 horsepower, the suspended door Pro Mod cars travel the quarter mile in under six seconds and at speeds exceeding 250 mph. 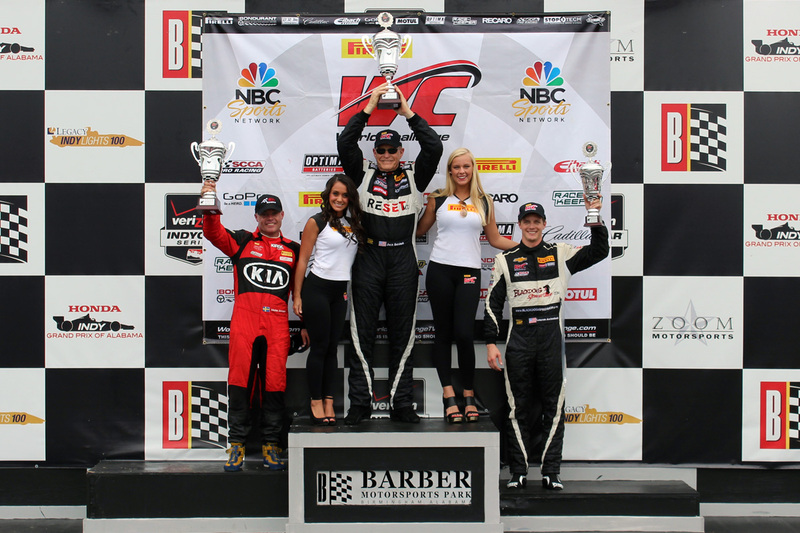 Kennesaw, GA – April 27, 2014 – GTSPORT RACING ended the Pirelli World Challenge at Barber Motorsports Park weekend on a high note. Jack Baldwin, of Marietta, GA, lead from start to finish during Round 4 of the GTS class race in his #73 RESET-MD/Motul/StopTech Porsche Cayman S to clinch the win and score his second podium of the weekend. Baldwin started from the pole after setting the fastest lap in Saturday’s Round 3 race in which he finished third. He held the lead from flag to flag for an amazing 29 consecutive laps during the 52-minute race. Baldwin also set the fastest lap time of Round 4 with his 1:31.937 best and an average speed of 90.061 MPH. Driving what could be described as the perfect race, Baldwin was ahead of the second place car by an astounding 4.782 seconds when he crossed the finish line. Buz McCall, of Boca Raton, FL, driver of the GTSport #72 RESET-MD/Motul/StopTech Porsche Cayman S had finished seventeenth in Round 3 the day before, and qualified in the twenty-second position. For Round 4, McCall utilized the knowledge gained during the previous race to deftly overcome car after car before he crossed the finish in fourteenth. Despite the setbacks encountered over the past two weeks, the GTSport Racing team refused to give in; they rose to the occasion and transformed several unfortunate circumstances into the race weekend of a lifetime. Earning two pole position qualifiers, a third-place podium and ultimately a first-place victory, the team’s hard work and dedication has been justly rewarded. Want to watch the GTSport Racing team in action for yourself? Catch up with them at one of the many Pirelli World Challenge races this season; the full schedule is posted at www.GTSportRacing.com. The two-driver GTSport Racing team is committed to bringing a world class effort to the Pirelli World Challenge series. Jack Baldwin is a legend in American Sports Car Racing with wins in every series that he has competed in as well as victories at every major racetrack in the United States during his successful career that has spanned four decades. Buz McCall has over three decades of racing accomplishments, not only as a driver but also as a team owner of one of the most successful Trans-Am teams in American History, “American Equipment Racing”. For more information, visit the GTSport Racing team online at GTSportRacing.com and “like” them on Facebook at facebook.com/GTSportRacing! 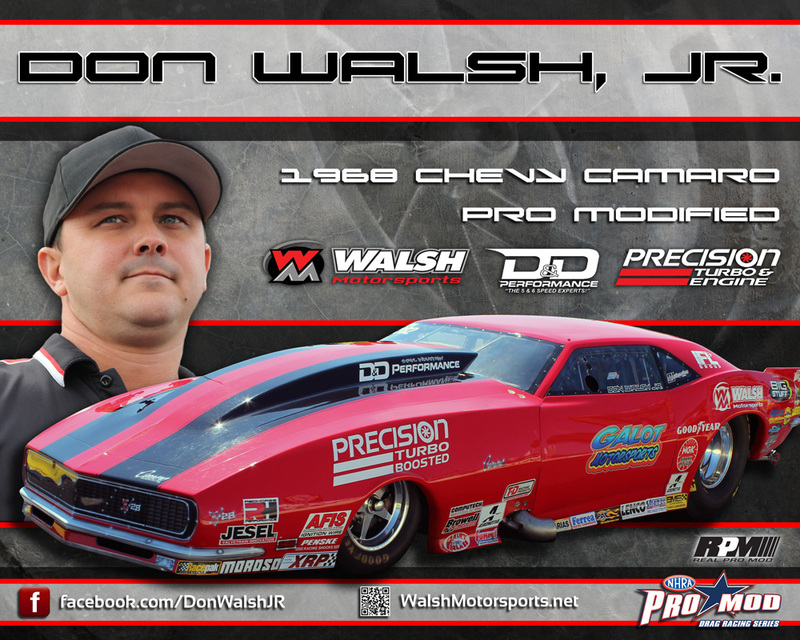 P.TEN Supplies Hero Card for Don Walsh, Jr.
P.TEN Marketing has honored with the task of supplying the hero card for legendary drag racer Don Walsh, Jr.
Walsh will be driving in the NHRA Pro Mod season for 2014 with his Precision Turbo & Engine boosted ’68 Camaro, owned by Harry Hruska, and competing under the GALOT Motorsports umbrella. 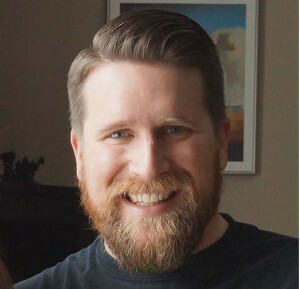 P.TEN also supplied the recommendation for the company who ultimately printed the cards, and worked with them to ensure the result was nothing less than stellar.